I joke a lot that I turned out just like my Grandma Mimi. We actually have so much in common aside from the obvious one -- our height. But I also ended up getting her klutzy, clumsy side -- not to the degree she took it to, but I’ve had my fair share of spills and accidents. Unbeknownst to me, we were actually even in the hospital at the same time back in February and got released on the same day. I took it even further by borrowing her extra walker while I was waiting for my ankle to heal. But what I love the most about our similarities is our shared love of beauty. For my whole life, Mimi made it a point to go and get her hair and nails done once a week. She loved going to the beauty parlor, as she always called it. I have definitely always loved beauty, but it’s within the last 10 years that I started doing the same thing. Neither of us could imagine washing our own hair! I will still do my own nails from time to time, but I have to admit there’s nothing like having someone pamper you. I love that Mimi and I shared this view of beauty—especially as a beauty blogger, but also because it’s just such a nice connection to her. During our family’s trip to Vegas awhile back, she and I even took a grandmother/granddaughter day and went to the spa together for manicures and pedicures. I remember the look of bliss on her face as she was sitting in the pedicure chair—I’m pretty sure I looked exactly the same. Speaking of Vegas, I will absolutely never forget Mimi’s love of the slot machines. And apparently they loved her right back, since we all joked that all she had to do was sit down at one and it basically spit out a $100 bill at her! She was the typical slot machine goer, though, always searching for “the right one” that would make her a winner. It was just so fun and funny to watch the magic happen. I really don’t think I ever saw her lose! When I was 4 years old, Cabbage Patch Kids were all the rage. And they were sold out EVERYWHERE. Mimi went searching all over Augusta to find one for me for Hanukkah and finally found the last one in the store. I was so overjoyed to get my doll that year and I still have it. It’s very special to me that she went out of her way to make sure I’d have one. Mimi loved to tell stories about our family. Traditions and memories were very important to her. She once wrote out our entire family history for me in her perfect block lettering, which I still have to this day. She even made some cassette recordings for me, which I believe are in my mom’s house. I definitely have a very good sense of where and who I come from thanks to her stories from the past. And even if we may have rolled our eyes once or twice because we’d heard them all before, I’m still so glad she reiterated them because now I have them to pass on to my children and grandchildren someday. Mimi always tried to give me clothes of hers that either didn’t fit her anymore or even things she’d never worn. They weren’t always my style, which didn’t offend her in the slightest. But a few years ago, she pulled out a dark purple leather jacket from her closet and handed it over, basically making me take it and saying it would look great on me and she really wanted me to have it. I didn’t complain, since who was I to turn down a gorgeous (and free) leather jacket? I have to say I wear it all the time and I seriously get compliments on it every time I put it on. I will continue to wear it for years to come and love the connection it gives me to her even more now. 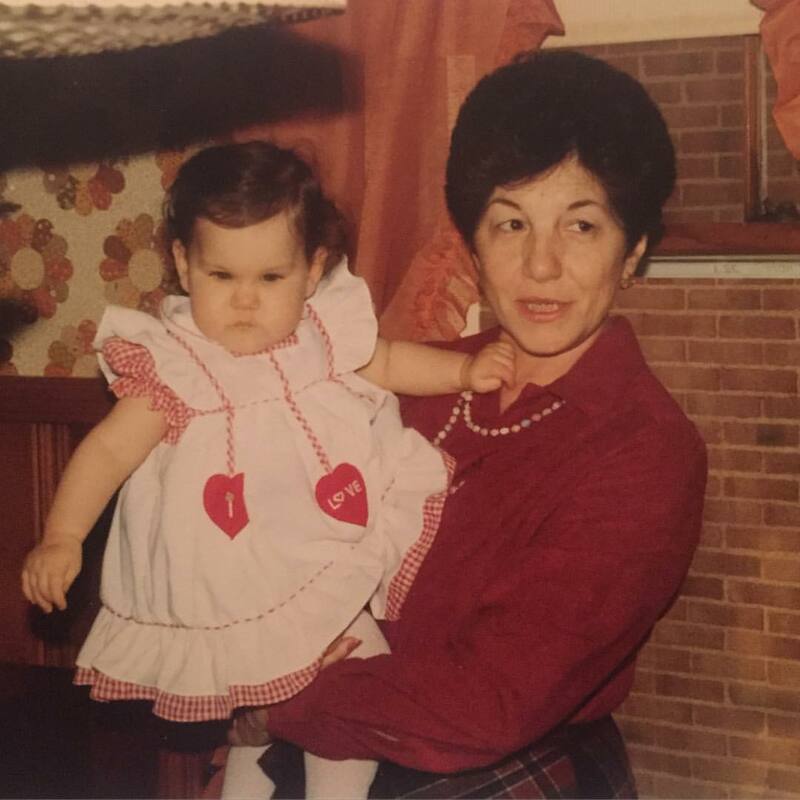 I loved my grandmother's deep voice and her laugh. I loved that she always had a hardcover book on the coffee table. I loved her commitment and dedication to my Grandpa Shelly, going to see him every day while he was in assisted living and spending all of her time by his side. I loved her stories about the True Sisters charity organization she was a part of and hearing about how important it was to her. I loved looking through her scrapbooks and photo albums. I loved that every item she packed or put away in dresser drawers was always wrapped in its own individual plastic bag. I loved that for our family's Sunday bagel brunches, she always made sure every person had his or her own individual butter knife. I loved that her nails were always painted a beautiful pale pink. Grandma Mimi, I'll miss you. A lovely post on your grandmother. And your face in that photo is priceless! Thank you so much! I have no idea why I wasn't smiling -- it's rare to see me without a smile on my face! What a heartfelt post. I'm sorry for your loss. Thank you so much, Amanda. I truly appreciate that. Beautiful thoughts, Jamie. I am so sorry that all of your grandparents died within just a couple of years apart. You were close to all of them, and they will be missed by you, Evan and your mom. Thank you so much! I really appreciate that. It is definitely tough to lose all four grandparents within 3 years, but I am very grateful for the years I had with all of them. I am sorry about the loss of your grandma. She is irreplaceable. Thank you so much, Norah. This is a lovely post, Jamie. I'm sorry to hear about your grandmother - condolences to you and your family. Thank you very much, Renu. I really appreciate it. I'm so sorry about your grandmother. In many ways she sounds like my mother who went every week to the beauty salon for her hair and nails. As someone to whom family is vital I know that you'll miss her love but there's so much she left you with. Thank you so much, Marcia. Your words mean so much to me. And I love hearing that about your mom, too! I'm so sorry about your grandma. She sounds wonderful. Thank you so much, Courtney. I really appreciate it. Thank you so much, Babi. Such a lovely post. I'm so sorry for your loss. I lost my grandmother when I was only 6 and at every family event all I hear is how much I look and act like my grandma Rose. Thank you so much, Lisa. I'm sorry for the loss of your grandma too, even though it was a long time ago. The loss is never really healed. But it's so nice that you look like her!